But what if your doctor points to the lab printout and tells you that your cholesterol is well within the reference range and that your heart is perfectly healthy? Well, this is exactly what’s happening when your doctor tests your thyroid using today’s TSH Test. Is the TSH Test accurate? 6,516,166 women (or roughly 6.5 million) in the United States are currently diagnosed as hypothyroid according to this TSH Test. And 58,645,496 women (or roughly 58.6 million) in the United States ARE hypothyroid, yet are being failed to be properly diagnosed by this test. In other words, the TSH Test is failing to diagnose 45% of women over the age of 15. Are you a woman 55 years of age or older? Then your odds are even significantly worse. I would say that’s an epidemic problem. …back in the 1920’s and 1930’s, before any of this modern day thyroid testing was developed, 40% to 45% of the population was diagnosed and treated for hypothyroidism. The good news is that there’s a much more reliable test that I recommend and that you can use, which I’ll introduce you to in a minute. But, before you get your next thyroid checkup and your doctor tells you that your thyroid is just fine, here’s what you need to know. It’s the reason why you can’t rely on TSH testing. Like any medical test today, the accuracy of the test depends entirely on the accuracy of the test’s reference range. Based on the cholesterol example used above, you and/or your doctor might have thought that your heart was in great shape. But in reality, you’re a heart attack waiting to happen. And this is exactly what’s happening with thyroid testing today. When it comes to the TSH Test, the gold standard of thyroid testing today, the normal reference range is a huge problem. Accordingly to most labs, your test results are considered “normal” if they fall within the range of 0.5 – 5.0 mIU/L. This “normal” reference range was first established because it was originally predicted that five percent of the population was hypothyroid. 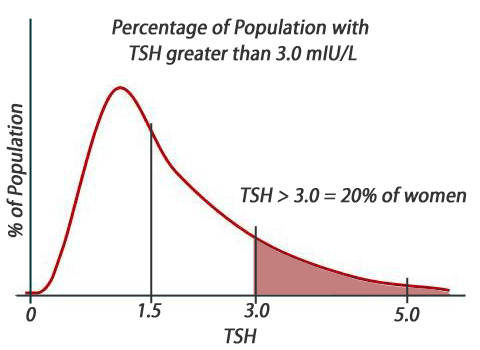 So, based on population studies for TSH, it was discovered that five percent of people happened to have a TSH greater than 5.0 mIU/L, which is how this upper reference range was established. This is illustrated using the graph below. This graph represents the entire US population based on their TSH measurement. If you look at the red shaded area above, a TSH of five was the cutoff that included the five percent of the population. Most don’t realize that this originally predicted five percent was based on a previous test called the PBI (Protein Bound Iodine) Test. Needless to say… any test that is developed based on inaccurate data will always provide inaccurate results. In 2003, based on newer research, the American Association of Clinical Endocrinologists were determined to lower the TSH reference range to improve the test’s accuracy. They recommended that the upper end of the TSH reference range be lowered from 5.0 to 3.0 mIU/L. This change is illustrated using the graph below. It should make sense that if all people with a TSH above 3.0 mIU/L were now diagnosed hypothyroid, that there would be a lot more people diagnosed. If you look at the new red shaded area above, this represents the new percentage of the population that should be diagnosed hypothyroid. To be precise, this equated to roughly 20% of the population. While this was a step in the right direction, was it truly accurate? Based on the work of Dr. Broda Barnes, whose research proved that hypothyroidism is the cause of modern day heart disease, we now have even more research to help us determine what the truly accurate TSH reference range should be. For example, the study below is one of many studies that gives us more insight. Thyrotropin levels and risk of fatal coronary heart disease: the HUNT study. THS between 1.5-2.4 mIU/L resulted in a 41% increased risk of heart disease. TSH between 2.5-3.5 mIU/L resulted in a 69% increased risk of heart disease. In other words, if your TSH is 1.5 mIU/L or higher, your risk of heart disease is significantly increased. 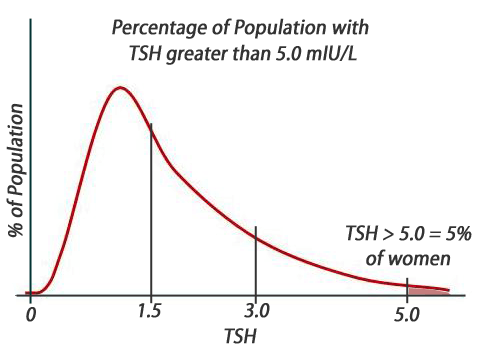 So, based on Dr. Broda Barnes’ research, we know that the true normal TSH must be below 1.5 mIU/L. 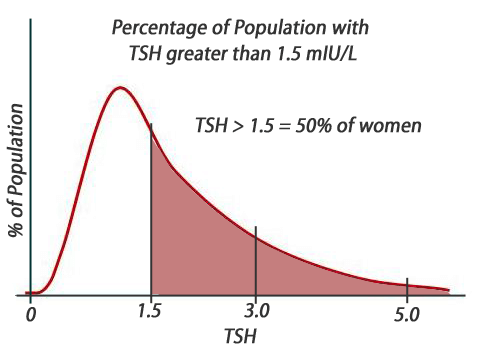 Based on further TSH population studies we know that roughly 50% of women have a TSH above 1.5 mIU/L and 50% of women have a TSH below 1.5 mIU/L. This is a great argument that shows that 58,645,496 women in the United States (or 45% of women in general) are in fact hypothyroid and are failing to be properly diagnosed outside of the mere 5% who currently are. And considering that prior to modern day thyroid testing that 40% to 45% of people were diagnosed hypothyroid, it provides even further evidence to support this argument. 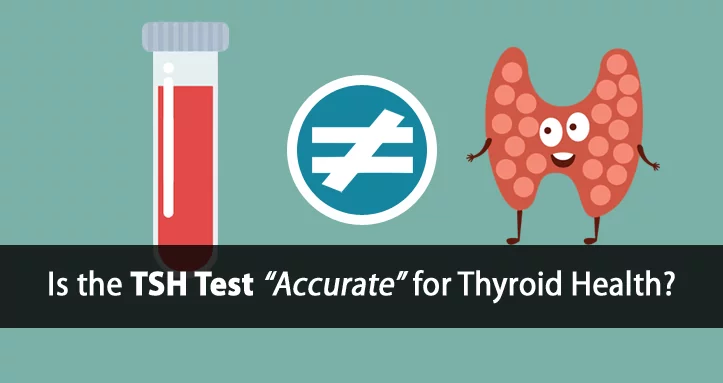 Regardless, this just goes to show you that the TSH test used today is completely inaccurate and alone should never be used to measure thyroid function. And if you’re TSH is 1.5 mIU/L or greater, then you are hypothyroid whether you’ve been diagnosed or not. But we recommend and prefer to use far more accurate thyroid testing. What Thyroid Testing Is Accurate? In the 1920’s and 1930’s there were many thyroid testing markers that were observed when doctors at that time were diagnosing hypothyroidism. And most are still valid today. However, other tests have also been developed and improved upon over the years that are even simpler and more accurate. One such test which we use with each and every one of our clients can be done for free and in the comfort of your own home. 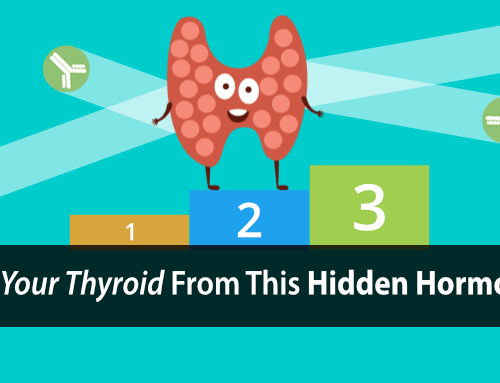 And in the Ultimate Thyroid Testing Protocol, we’ll show you exactly how you can use this test yourself and track your thyroid health as you go. This protocol is simple and easy enough for anyone to use. If you’re not already using it, then I highly recommend you start now. Get more information about the Ultimate Thyroid Testing Protocol here. And next time you get your thyroid tested you might want to reconsider whether your results are as accurate as you and your doctor might think. If you do nothing else, then be sure to use the more accurate guideline provided and make sure your TSH is below 1.5 mIU/L. In my experience, a TSH closer to 1 mIU/L or below is even better. yeah, that’s all fine…but the reality is, doctors just don’t care WHAT you’re doing at home…good luck convincing them that they should do anything about it. 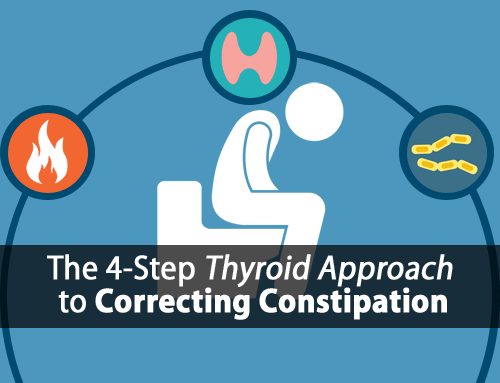 The TSH tests are the standard, and even with a long history of hypothyroidism, they will still drop the med’s mg in accordance with what they read in that lab report. It has been devastating for me. I’m talking MAYO CLINIC, no less! how does 14.6 hit you? That’s what happens when the labs say 2.7…well, you drop the mgs of course. I love what you do, and I’m grateful for your help, but it has made me all the more frustrated because the majority of doctors still think they’re God, and I’m quite literally sick and tired of what really goes on out here. Hi Holly, I understand the frustration but the point is not to convince your doctor. The point is that we have no choice but to take matters into our own hands which is why we provide the resources we do. I thought I was doing well with my thyroid over the years. Then 5 years ago I just out of the blue starting to loose weight. I was happy because I needed to, but I didn’t do anything to change my life that would cause this. It has stayed off for 6 years, and I’ve done well, until I got a blood test done in Aug of 2015, and they said I needed to lower my meds, well that’s well my life turned to hell. They said I had to wait 6 months before Medicare would pay for a new test so I was the at the office 6 moths to the day and my reading was 13.5. I can’t sleep, I’m cold, my hands,skin and hair are dry, I have foggy thinking, and I could go on. They have increased my meds that used to be at 150 then down to 125 now at 137 for the next three months, I just don’t know what to do. Hi Shirley, sorry to hear about the trouble. This is one reason why we’re working on more resources, including one on thyroid medication because this is a major problem for a lot of thyroid sufferers. Hopefully you’re on our email list so you can hear about this resource once it’s finished. Holly, I’m was in the same boat as you are until I decided to take my health into my own hands. I now supplement with Transfer Factors and am healing my “leaky gut” as well. My energy level has tripled and my weight is falling off. Our bodies are amazing and have the ability to heal themselves – we just need to give it the right nutrients (something no Dr can stop you from doing). Holly, I feel your pain. I am a 40 year long thyroid patient. I STILL get frustrated with Drs. trying to yank my chain with tests & restricting my Nature Throid. This is why I have the correct tests done on my on dime (ones my Dr. won’t order), and dose myself the CORRECT way. Yes, I have to find a source for my extra meds, but I’ve had no problem with that. The days of thinking Dr.’s are god are over! There is enough information out there for us to treat ourselves now! Holly, I have the same issue. Mine is too high but doctors won’t change my dosage. Just testing at home wont’ get them to change it. You say above in another comment this is why you provide resources. What are they other than this at home test? Am I missing something? Hi Carol, we have a number of resources/protocols available, meal plans, a comprehensive step-by-step program, exercise program, etc. Just TSH has been around 9-10 for me and when was on medz felt same as now with no medz. I am perhaps a bit of an outsider here as I am English and male, but I was diagnosed with hypothyroidism about 30 years ago and I am on 225 mcg Levothyroxine per day. I am supposed to have a TSH level test each year, but I often have to remind the doctor to do it, and the answer is always “normal”. I don’t feel too bad, and I am not overweight, but I do wonder whether I ought to be investigating my condition more thoroughly now I’m 67. With out National Health Service, we have to go out of the way to obtain anything but standard testing (which is free of charge). Also – why is the article aimed specifically at women? Am I a rarity in being male and having this condition? Very interested in your work! Hi Jeremy, the article applies to men too, however the research studies used in this particular article were looking specific at women. Everything applies to you as well. Hello Tom Brimeyer or anyone else that could help. I am new to this and recently had my thyroid checked and it was 4.15 but my antibodies were very high 695 They tried putting me on the lowest dose of medicine but mad me dizzy. My Doctor said try Half of pill but then I called the specialist that I have seen before and then she said have them test you for the Free T3 and Free T4 and most likely I might not have to take the medicine. She said most regular doctors or Phys. Assistance don’t know enough about the numbers for the thyroid. The are telling me I have the Hypothyroid Hashimoto’s disease. Please help what I can do naturally because I hate medicine. Thank you for your time. Also I have had a lot of symptoms of a Hypothyroid Hashimoto’s disease tired, weight gain, menstrual problems, cold all the time and dry skin and hair. also have a lot of inflammation stiff joints and I can’t take Ibuprofen or advil. I will see the specialist on Wed. the 16th to see what she says but when 2 different doctors tell you what it is or when the specialist tell you might not have to take medicine but you still have all the symptoms, What do you do. I have been going through a lot for a year and a half with my hormones and menstrual. I had 2 Mirena IUD and ever since they removed it a year and half ago. It’s like hell broke loose with my body and there were constantly feeding me progesterone to have a monthly cycle. I have only taken 1 course of it since last july. I was going to a acupuncture for treatment. Just thought I would explain the rest to my story. Thank you again for your time. Hi Gail, Hashimoto’s itself is caused predominantly by estrogen dominance. And the Mirena contains synthetic progestins which are actually very harmful and wouldn’t help the situation as it inhibit your body’s ability to produce progesterone on its own. Hopefully what their using now is at least a bio-identical progesterone source. and did hormonal (urine) testing and estrogen not high ! 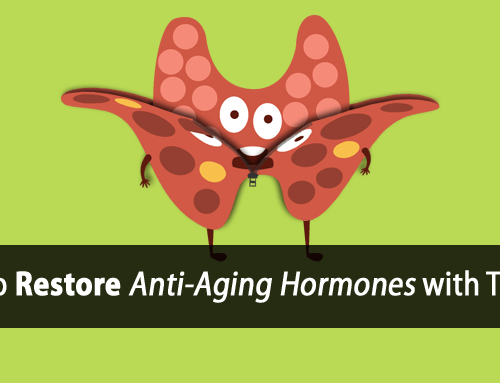 so hashimoto develops or remains.. even when now, when estrogen is not an issue? Hi Rom, unfortunately you can’t test estrogen accurately in the urine or in the blood because it accumulates in the tissue. With hypothyroidism, your liver can’t store glycogen which is necessary to produce glucuronic acid. And glucuronic acid is what attaches to estrogen and other fat soluble hormones to make them water soluble so you can excrete them through your urine. In other words, you’re not able to detoxify estrogen through your urine which is why you won’t find high levels of it there. When testing for estrogen we most often test for serotonin and prolactin which can be tested through blood and are a more accurate indicate of true estrogen levels. Thank you so much Tom ! So should do serotonin and prolactin test; like direct laboratories.. would have those? Btw I am 104 lbs 5.8.. not overweight; if that matters in ref to estrogen; and brittle nails; lack of motivation; procrastination, severe insomnia from 23 yrs on synthroid :(.cold hands and feet is not issue anymore; used to have even when was 16. Testosterone was slightly elevated; but was told that is not a bad thing. My wife has TSH = 6 and cold hands and feet all the time. Her skin is also dry and she feels anxiety ( nervous ). Are all these symptoms due to throid ? None of the doctors say anything about these symptoms even specialist endocronoligist. Please help … She is now taking 50mcg levothroxine and continuing to take while pregnant. Hello, I’m new to this too. I have all the symptoms of hypothyroidism, but my tests came back normal except for my T3 which they said had little inflammation, but not enough to be on meds. Just not sure where to go with this. I workout at least 5-6 days a week for at least 2 hours, and I’m mindful of my eating. I feel like I’m getting defeated , and don’t know what else to do. Thanks a lot for the info . Could you please shed some light on whether the fetus ( In pregnant women ) use the T4 or T3 ? Which trimester the baby use mother thyroid hormones etc ? Appreciate if you could point me to any article of yours on this as well..
As always , thanks a zillion and god bless you! Tom, can you recommend a reliable accurate thermometer? Hi Anthony, I’ve tested many different types, temporal, forehead, etc. and the only truly reliable thermometer is mercury. I have my clients use mercury which typically need to be purchased through a vet supplier these days. I still plan to test some other non-mercury alternatives when I have the time. Some digital thermometers work well enough but make sure you leave it in your mouth for a few minutes before turning it on to help ensure a more accurate temp. 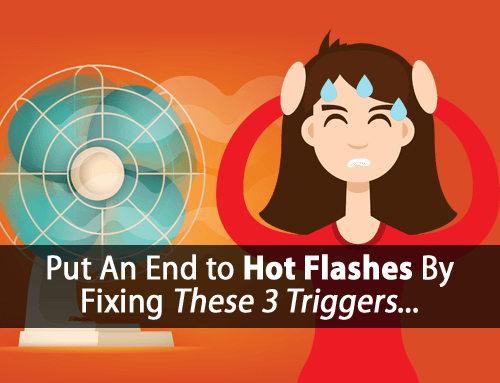 Tom – I was fortunate enough to have a mercury thermometer for ovulation that I used many moons ago when I was trying to get pregnant and it works great for your protocol. I don’t know if it would help with others following your protocol to perhaps purchase an ovulation thermometer and maybe get better accuracy despite their lack of mercury. I was also quite surprised to find a supplier of mercury thermometers online… http://www.mercury-thermometer.com/index.php a bit pricey but may be worth it. Hi Virginia, those thermometers are quite expensive. If you looks for them via veterinarian supplies, you’ll find them much cheaper. Hi Tom, Do you take clients on a personal basis? I’ve read your info and followed all the diets and protocol, and I’d love some personal analysis of my lab results from someone other than my M.D. I believe there is a better way to treat this as my hypothyroid seems to have been a direct result of pregnancy/birth, no family history. I’ve taken synthyroid for 8.5 years now and would love more than anything to be free of the daily pill required. Thanks so much! Hi Lisa, I do offer consultations where we can discuss lab results and more. Send an email over to support@forefronthealth.com and we’ll be able to help further. Hi I want to thank you for all your valuable information, I read things on your web site daily, I couldn’t be more appreciative for all your wisdom and insight. I believe I was struggling with hypothyroidism for years, my family doctor kept telling me it was normal, it wasn’t until I finally looked into a second opinion and was pretty much on my knees with symptoms did the new physician tell me that my levels weren’t bad at 5.6 and that he would give me something just to help if I felt I was symptomatic. I clearly said are you kidding me! Yes give me medication! I was put on synthroid and felt pretty good for a little bit then symptoms returned. The doc only wanted to give me 3 months supply so that ” my body didn’t become dependant” I went back and pretty much had to beg for a natural dessicated med… He gave in finally. I went on that and I felt the best I had in years, I mean lost weight, skin cleared up, aches and pains went away, had hormones I never knew I had, pretty big deal for a young lady. I didn’t stop there as I knew after the 3 months the doc would take away my meds and I couldn’t go back to the way it was… No way!! So I sought out a Naturopathic doctor and she has been the best thing ever, manages my scripts, blood tests, complimentary supplements for adrenals as well. My anxiety levels went from through the roof, to a sense of homeostasis. Including dealing with extreme high levels of estrogen at 1300 due to being on BCP for years, she had me taking indole 3 carbinol, now I sleep like a baby throughout the night, where as before I had insomnia it was awful! For about a half year now… Until recently something strange happened… Gradually I started to get a sore ankle, then acne came back…sore fingers, aches in my face in my throat. I am not sure what has gone wrong but I am now questioning a bad batch of meds. I was taking 60 mg’s but took upon myself to take 90 mg’s because I couldn’t take the aches, the soreness and daily headaches. It has seemed to improve now. The only thing I can think that had changed was I stopped taking my adrenal support and Methylated B vitamins…otherwise I have no answer. I got a new batch of medication I am going to try tomorrow I hope it works and I can get back on track. I am also going to see the naturopathic again see what she thinks.., if you have any advice or info. I would so appreciate it as well… Thank you for all your work into thyroid ? Hi Tom, I read the good news that yout TSH should be below 1.5 …because mine is, also the free T4 and T3 are within range. Still I was given a prescription for 1/2 of a tiny pill of Thiamazol Sandoz 20 mg, twice a week, which I started taking last week. So far I don’t feel any difference which makes me think that I don’t need any medication at all. The doctor must think so, too, that’s why I got such a low dose. I just said to my general practitioner that I want to know why I’m gaining weight and why I am so tired all my life. That’s what started the whole thyroid research which again led me to your site for which I am truly grateful. Whether I’m hypothyroid or not, I like to read your articles, so much to learn about your own body. Thank you. Hi Tom I am having problems with my thyroids. Hypo. I don’t know what to do. If I take guia for my thyroid and adrenal health will this help? Hi Tom, great info. How do you feel about a TSH that is going the other way whilst on medication. I take 45mcg of T3 only after many unhappy years on T4. It’s 0.057 with the bottom of the British range being 0.27. Is the suppressed TSH concerning? My T3 level is slightly below top of range. I’m feeling better than ever with no concerning palpitations etc. What is the normal range for T3 & T4?